ON ANY GIVEN DAY, in Sleeping Giant Provincial Park, you can identify more than 100 species of birds. We heard quite a few ovenbirds that day, and identified a host of others — Magnolia Warbler, Black-capped Chickadee, Swainson’s Thrush, and Winter Wren. From up on the rock formation itself, the Sleeping Giant feels alive. The forest is dense; there is constant birdsong. But from a distance, the Giant is seemingly at rest. The stone figure sleeps peacefully on his back, arms folded on his chest. He’s mysterious and looming — you can’t escape his presence. According to Ojibway legend, the Sleeping Giant is “Nanabijou” — The Spirit of Deep Sea Water — turned to stone when the white man was given the location of a nearby silver mine. A formation of volcanic rock mesas on the Sibley Peninsula jutting out into Lake Superior, the Giant divides Thunder Bay to the west from Black Bay to the east. The top of the Giant is among the highest points in Ontario and after looking at the Giant for a few days from across Thunder Bay I was finally climbing to the top. As we hiked along the Top of the Giant Trail, Greg sang along with the birds and identified plants. We saw Thimbleberries, Ostrich Ferns, Largeleaf Asters, Eastern Cedar, and White Pine. From above Lake Superior, we looked west toward Thunder Bay. The sky and water were a seamless hue of bright blue and the overhanging cliffs dropped 950 feet straight down into the lake. If this were back home in California, I thought, there would be a guardrail. But here in one of Ontario’s most pristine wildernesses there was none, nor any warning signs. The wilderness was still wild and I ventured out to the edge. From the trailhead take the Kayebun Trail 5.0 km (3.1 miles) to the Talus Lake junction. Take the Talus Lake Trail for 1.5 km to the Top of the Giant Trail junction. The Top of the Giant Trail is where the real climbing will begin. 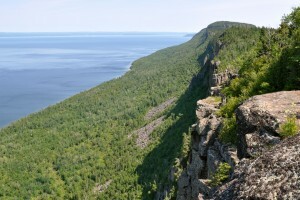 You’ll head straight up the mountain for 2.7 km until you reach the “Top of the Giant,” which sits 750 feet above Lake Superior. There you will find a “top of the giant” sign, a cold creek and a bench for resting. To get to the Lake Superior lookout it’s another 2.0 km of more gradual climbing. The extra hiking is well worth the trek. Once you reach the end of the trail, you’ll look out over Thunder Bay and Lake Superior from 950 feet above. To shorten the distance of your hike, you can bike, kayak, or sail to Tee Harbour, which takes 10km (6.1 miles) off your total roundtrip. If you want to break the hike into two days, the camping area at Tee Ha•rbor is excellent. Make sure to reserve a campsite (1-888-ONT-PARK). First lesson in hiking with a naturalist — they stop a lot to identify plants and birds, so if you aren’t watching your step, you’ll likely run into your nature guide. Sleeping Giant offers a range of naturalist education programs. Check with the visitor’s center for weekly programming (807-977-2526).